See the position description for more information. An important source of information for landowners considering protecting their land. To encourage and promote the protection of these lands and their natural diversity through education and other assistance. Our quality of life is protected when open space is preserved. Air, water, and wildlife benefit from natural habitats, and open space landscapes are attractive and enhance community values. 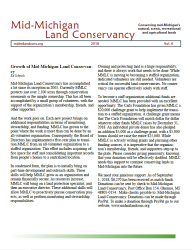 Preservation of farmland ensures continuation of farming in mid-Michigan.